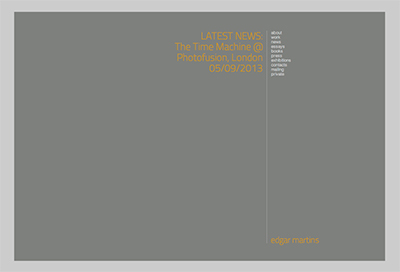 Edgar Martins to speak at The State of Photography II: Symposium, an initiative by Grain Photography @ Birmingham City University. The State of Photography II will explore, debate and review how photographers and photography practice develops and responds in our current challenging times. How do we look at our world today and what does the world look like to photographers? We invite acclaimed and outstanding photographers and artists who document the world around us to showcase their recent work. Each have different approaches to making their work which is issue based. They have been artist, story teller, observer, participant, explorer and poet. Their work has been made through collaboration, participation, community engagement, research and obstinacy. Some document communities and people they are familiar with others offer external perspectives on social issues and situations. Does one offer a better way to tell a story? Is it important to come from a community or do you become too involved? Is it more objective to come in from the outside? How do we insure the engagement is sincere and does not exploit? The documentary role of photography is changing, particularly as work is commissioned and made for gallery settings. Photography can impart the greatest truth of our times and sheds light on injustices, inequality and other aspects of our society. It has been and remains one of the strongest vehicles for change as photographers explore polities, gender, society, sexuality, diversity, economics and environment. It seems today – a time of political unrest, flux and crisis – more essential than ever to explore the role that photography can play. During the Symposium we will hear from the perspective of the photographer, curator and academic. They share our concerns about the present and offer a diverse range of practices, experiences and stories that document the state of humanity and the world today. The State of Photography Symposium aims to present new bodies of work, question and challenge ideas, as well as offering advice and talking about positive approaches to influence change, provoke, prompt and give a voice. We will hear from and celebrate those that create self-initiated projects and commissioned bodies of work and see a range of photographic practices that are at the cutting edge of photography now.